There’s a trendy lunch café near our house that serves upscale sandwiches, prepared salads, and side dishes. My favorite dish there is the shrimp salad, which has generously plump shrimp in a creamy sauce. I’d been thinking that I really ought to try making something like that myself, so when Green Valley Organics hired me to develop a recipe using their new lactose-free cream cheese (and to share it with you), it was just the nudge I needed. Unlike the “bricks” of cream cheese that come in a foil wrapper, theirs is similar to the whipped versions. Since they don’t use gums or stabilizers, it expels a little bit of whey once it’s been opened (no big deal, just pour it off). I like that — it means it’s actually real food; it still has live cultures that are, well, active. Their products are great for people with lactose intolerance who want to enjoy cow’s milk products, of course, but they’re also great for the rest of us. The cream cheese is mildly tangy and just a little sweet, and I seriously have to resist the urge to eat it by the spoonful right out of the tub. In short, it’s good stuff. I’d also like to take a moment to talk about shrimp, the most popular seafood in America. If you make this recipe (or eat shrimp anywhere else! ), I hope you’ll consider where your shrimp are coming from, how they were raised or caught, and the impact that has on the shrimp, the environment, and the people who work to bring the shrimp to your table. Unfortunately, it’s difficult to know exactly what you’re buying — but at least when you buy a bag of frozen shrimp at the grocery store, it will tell you the country of origin (usually in small print on the back). The Monterey Bay Aquarium’s Seafood Watch program has some guidance on shrimp selection, though I sometimes find their recommendations hard to figure out (how do you know if it’s “Farmed” or “Farmed in fully recirculating systems?” They don’t put that on the package!). 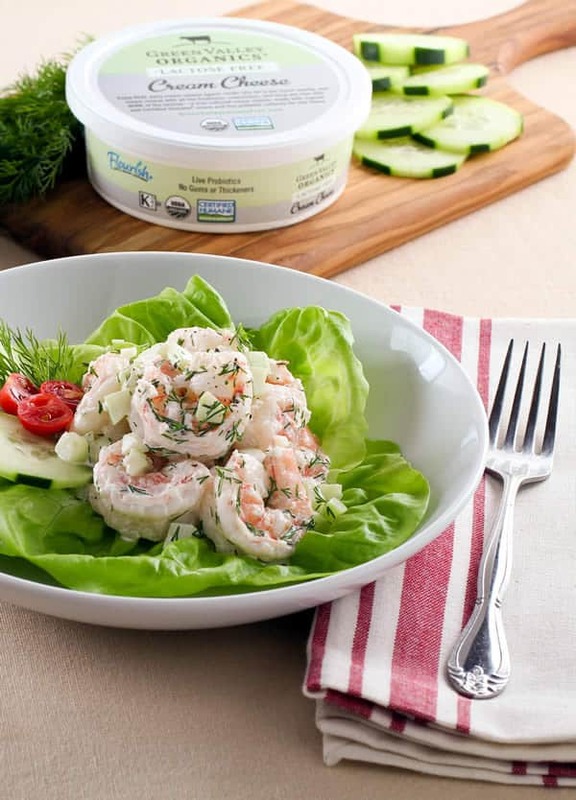 The Safina Center has a helpful online seafood guide on shrimp that’s worth a look, too. But don’t let all this shrimp-sourcing talk get you down–thankfully there are good options out there, and the more we choose those, the better the options will continue to get. 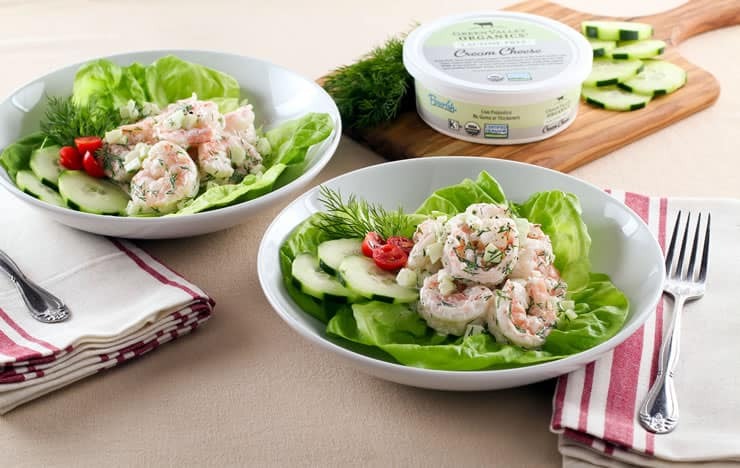 So go track down some good shrimp, pick up a container of Green Valley Organics Lactose-Free cream cheese (available at Whole Foods nationwide, or use this storefinder), and make this easy, delightful salad to bring along to your next party…or just keep it all to yourself! Since the Green Valley Organics Lactose-Free Cream Cheese does not have any gums or stabilizers, you'll need to treat it gently--and keep it as cold as possible. Bring a large pot of water to boil. While the water is heating, prepare a large bowl with ice water. Add shrimp to the boiling water and keep on the heat until just barely cooked through, about 3 minutes (it's okay if the water doesn't return to a boil). With a slotted spoon, move the shrimp into the cold water bath to stop the cooking, and allow them to cool for a few minutes. Once the shrimp are cold throughout, drain and place on a clean dishcloth or paper towel, patting dry. Dry the cold bowl that the shrimp were just in, and then add the cream cheese, dill, garlic, salt, and pepper and stir briefly. 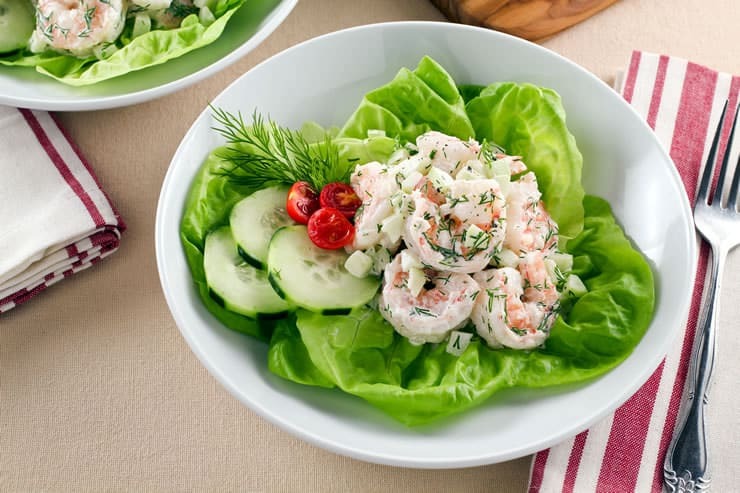 Gently fold in the cucumber and shrimp until evenly coated. Do not over-mix. Place in the refrigerator for at least 30 minutes, but preferably overnight, to bring out the flavors. Serve cold, and enjoy! I DID eat it by the spoonful out of the tub. It IS that good! I can’t wait to look for this product. Meanwhile, your lovely salad is just the dish I need for a lunch here next week. If it’s a chilly day, I’ll add a cup of soup. I love the sound (and simplicity) of this dish. Good to know about the cream cheese from Green Valley too. I was looking for something new and bright for our holiday get together. Perfect! Any suggested replacements for the cream cheese? I don’t have lactose intolerance, I’m allergic to whey. Would Greek yogurt be an option (since more of the whey is strained off)? If so, I’d probably give that a try first (I prefer the Fage 0% Plain – it has the most neutral flavor). Or I’d recommend switching to mayonnaise — either one you make yourself (such as this recipe), or one made with high-quality ingredients (no soybean oil…I like Sir Kensington’s, but there are plenty of other good options out there), and using just enough of it to tie everything together. Wow, thanks for the fast reply Andrew! Any cow’s milk product causes wheezing, coughing and congestion so I don’t think the yogurt is an option. But, oddly, goat’s and sheep’s milk doesn’t trigger the same reaction. I think I’ll try it with a mild unripened goat cheese!